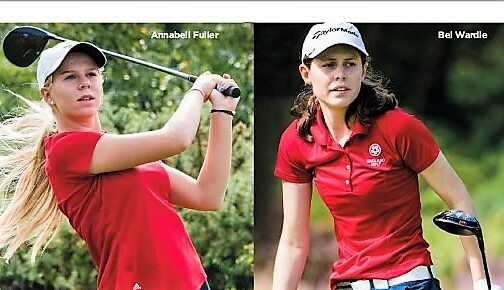 Nations Cup at "Helen Holm"
Leading England players Annabell Fuller and Bel Wardle will represent England in the Nations Cup at the Helen Holm Scottish open stroke play championship at Troon this coming weekend. They’re both on top form and occupying the top two places on the early England Golf Women’s Order of Merit, with Wardle currently No. 1 in the table. Wardle has won three national titles in the last eight months while Fuller has one and led the scoring when Europe's women took on Asia Pacific last month. . The Scottish women's open stroke-play championship takes place at Troon Portland and the Royal Troon's Open championship links from Friday to Sunday (April 20-22). The Nations Cup will go to the team with the best aggregate score over all three rounds. Annabell Fuller, 15, (Roehampton, Surrey) was the youngest player for Europe in the Patsy Hankins Trophy match against Asia Pacific - and the team’s lead scorer, losing only one of her five games. She is the English U16 girls’ champion and was runner-up to Wardle in the Portuguese women’s amateur, where they played-off for the title. Bel Wardle, 18 (Prestbury, Cheshire) added the 2018 Portuguese women’s amateur to her victories in the 2017 English girls’ and English women’s open championships. She has just won the prestigious Comboy Scratch Trophy at Delamere Forest, Cheshire, finishing three shots clear after a seven-under par 65 in the second round.